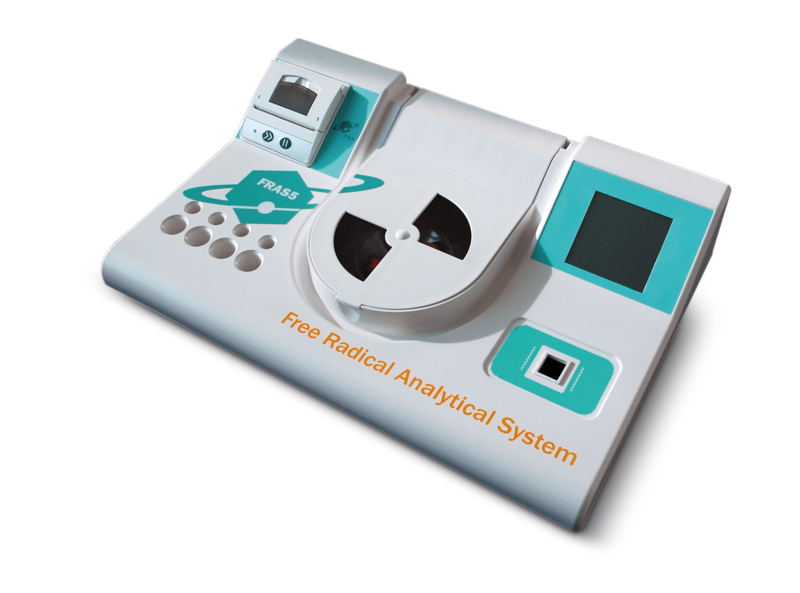 Innovatics introduces a convenient and technologically advanced system for the global assessment of oxidative stress, consisting of an innovative Free Radical Analytical System, FRAS5, two blood tests, d-ROMs fast test and PAT test, and one saliva test, SAT test. FRAS5 analytical device was developed by renowned inventor Dr. Fabrizio Callegari of H&D srl in Parma, Italy, a true pioneer in the field of medical device development for over four decades. To date, more than 800 clinical studies and scientific articles published worldwide have validated the scientific value of this highly innovative diagnostic approach to oxidative stress. FRAS5 is a photometric analytical system dedicated solely to the global assessment of oxidative stress in biological systems by enabling the measurement of pro-oxidant status in plasma samples by means of d-ROMs fast test and of anti-oxidant status in plasma and saliva samples by means of PAT test and SAT test. The principle adopted is the absorbance measurement of a sample solution in a cuvette through a monochromatic light beam; once the absorbance value is obtained, the instrument automatically provides conversion into the appropriate measurement units by using proprietary software. Integrated unit consisting of built-in centrifuge, photometer, printer and control panel. It performs all the required steps to complete the tests procedures, from blood sample centrifugation to tests results printout. The centrifuge and photometric unit are temperature-controlled at 37 °C. Lightweight, small footprint, no special storage required. Easy-to-follow procedures by means of prompts on the touch screen display. Proprietary software OB Manager available for data storage, oxidative stress risk assessment and custom reports generation. Download the (OSI) Oxidative Stress Index pdf. OB Manager is a proprietary software designed to facilitate the interpretation of the oxidative stress tests panel and to integrate their values into the larger clinical context of each subject. The software is based on a specific algorithm that allows integration of personal, clinical and lifestyle data with biochemical data – the results of d-ROMs fast and PAT test – and generation of custom reports, outlining the risk profile for oxidative stress and a series of suggestions in terms of lifestyle changes and antioxidant therapies, meant to mitigate higher than normal levels of oxidative stress. OB Manager also facilitates the calculation of the Oxidative Stress Index (OSI), the integrated index calculated from the values of d-ROMs fast test and PAT test. Single license on CD-ROM, delivered with the purchase of FRAS5. OB Manager Online – online access granted to FRAS5 owners, allowing convenient 24/7 data access from any device: PC, tablet or smartphone.